Want to be notified of new releases in Warehousing/Warehousing? Go grab it now, or get it in-game by searching for Warehousing. Want to see Warehousing available in your language? Does the quality of our existing translation leave you wanting more? Please help us translate the mod on Crowdin! Create a free account (or log in with Google, Twitter, Facebook, GitHub, or Gitlab) and help make this mod (even more) awesome! 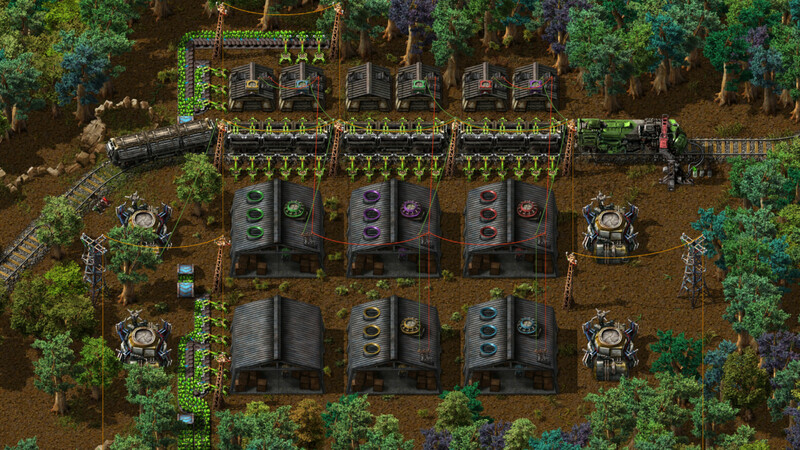 Now updated for Factorio 0.17! Just like the base-game research, technology requirements have been overhauled. There are now two levels of "Logistics Warehousing" to research, and Warehousing research in general is more expensive. Crafting recipes were also updated—no more wood! Building storage capacity (except logistic storage variants) was finally rebalanced to reflect the 3x3 and 6x6 entity sizes. Storehouses now accept 450+ stacks of items, and Warehouses take 1800+ stacks. The old capacities are accessible via a startup setting, if you have an existing map with circuit logic that will break with the changed inventory sizes. Copying the research cost of "Logistic System" remains, as a startup setting (off by default, to save a bit of loading time). Enabling it will update the cost of "Logistics Warehousing 2" to match if you have a mod that changes the cost of "Logistic System". As before, report incompatible mods in the forum thread or GitHub issue tracker. There's also a new setting to disable inventory icon scaling, if you don't like how the stretched icons look on top of your buildings. Localizations for the new settings are almost entirely incomplete, except for a lucky few strings; go to Crowdin if you can help translate them into more languages! Logistic warehouse research cost is now based on the cost of "Logistic System", for better balance when using mods that alter that research. Adds 6x6 warehouses that allow you to store a lot of items, and smaller (cheaper) 3x3 storehouses with less capacity. Warehouses and storehouses also have logistic versions (passive provider, active provider, storage, requester, and buffer), just like chests. You can also attach red and green wires to the warehouses, and they'll attach to the correct points on the corner of the logistics warehouses. Storehouses contributed by Hanniballo. Updates for Factorio 0.15 contributed by kingarthur, with integration help from dgw (joined as co-maintainer as of 0.0.13).